I had a pleasant surprise last night while going through a stack of old magazines I discovered in the back of my closet. I discovered that I had a copy of Where the Wild Things Are tucked away in that stack of magazines! Not much more can be said for this children's classic tale that hasn't already been said before. I'm almost sure that everyone has read this at one point or another in their lives, and if you haven't, it's worth it. 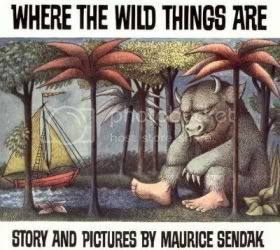 I know that it was the illustrations that I remember most from my childhood, and as I read it again last night, they all came back to me in a rush of nostalgia! No child's library should be without this book. I love this. Do you know his other work? All of it has that very creepy edge to it. Children, of course, love them! I loved this book! As did my sons.